Allows you to publish Joomla! 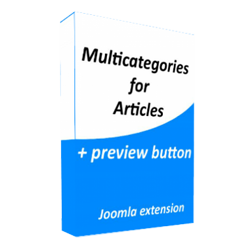 articles into multiple categories via modal window with AJAX functionality. Works for backend & frontend! + Preview Button in Article edit page! Full integration for article URL routing, breadcrums, blogs, page navigation, etc. Possibility to enable creating Canonical URLs for articles in multiple categories - for avoiding having duplicate content! TWO INTERFACES TO CHOOSE FROM! Long awaited ORDERING FOR MULTIPLE CATEGORIES! All the functionality is also available in Frontend article management! As a bonus, you will recieve an Article Preview button functionality in toolbar of Article edit form view! Safe to install and uninstall. articles from multiple category selection. Possible to set if articles have to belong to ALL selected categories or at least ONE of them. You can activate this extension from our site without any problem.